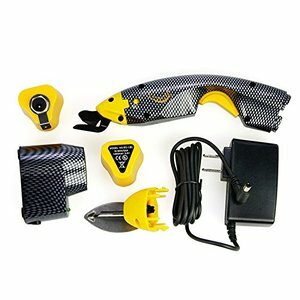 USA EC Cutter Electric Scissors Kit - 110 Volt - Comes with, All-purpose blade for straight quick cutting, Shoe Blade for patterns and fabric, Rechargeable DC Battery, Battery Charger AC Adapter, Transformer with Power Cord. 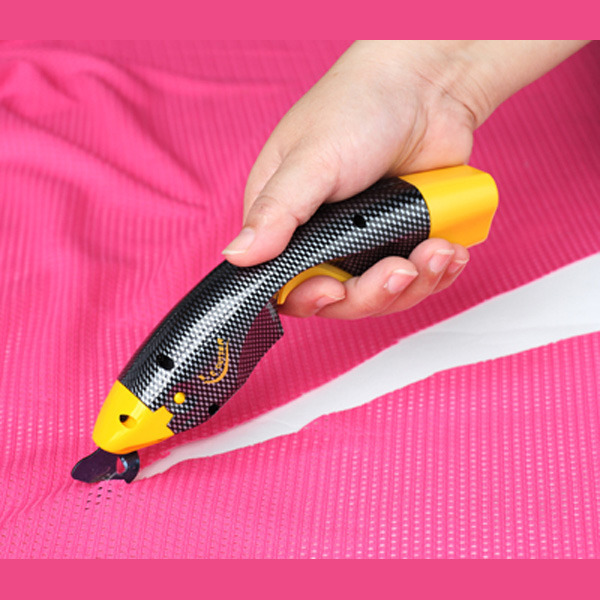 Note: While the EC Cutter is excellent for cutting fabrics, it is not suited for stiff materials like cardboard. 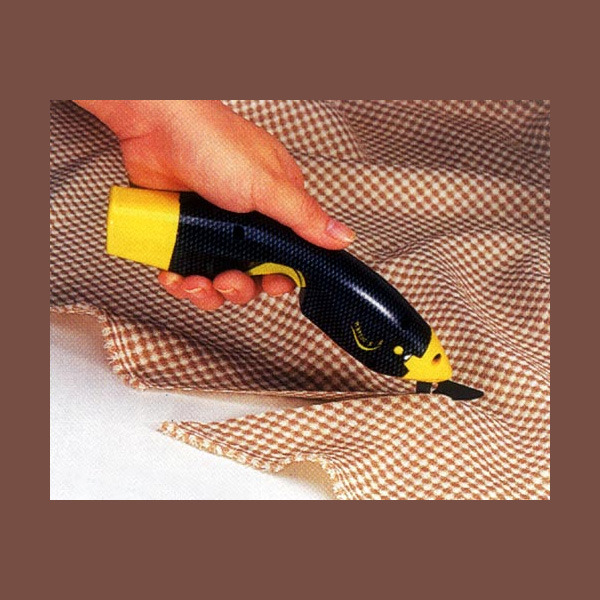 * Cuts Aramid Fibers, Kevlar and other tough fabrics. *Cuts Kevlar, Carbon and Glass Fibers, Pre-pregand Composites. * Superior ergonomic design. Requires much less effort to use than cutting manually. * Light weight and maneuverable. * Rechargeable long lasting battery. No cord to worry about. * Carbide insert blades for longer wear. * Can be operated with cord and battery adapter (supplied) for unlimited cutting time. * Short rapid strokes for intricate work. * Not recommended for material over 1/8 inch thick due to short stroke. * All parts included in the kit are also available as spare parts. Like a hot knife through butter! Give your fingers a break and take the work out of cutting. 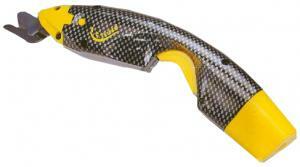 These electric shears make quick work of Fiberglass, Carbon fiber and Kevlar fabrics at the push of a button. Its unique blade configuration cuts fabrics and vinyls with ease but can't cut your fingers. Rechargable battery provides hours of use between charges and eliminates the need for awkward or restrictive power cords. Ships complete with blades, rechargable battery, battery charger, AC adapter, and transformer. US Warranty 30 Days labor on defects in materials and workmanship. * Ergonomic design for comfort and maneuverability. * Weighs just 8 ounces. * Powered by long-lasting rechargeable and disposable Ni-H2 battery or AC. * Use indoors or out. Excellent for marine work. * Short rapid blade action permits intricate, precise cuts. * Tungsten carbide blades provide extra long life. * Extra blade assembly with base plate to protect work surface. * Cuts plies to 1/8" (3.175mm) thick. * Includes rechargeable battery, charger, transformer, AC adapter and instructions. Easy Cutter Scissor on test. Electric scissors. A test on heavy synthetic woven sail cloth. The Edge is what gives the EC Cutter its cutting power. The half-moon section of each blade is specially hardened to make the edge sharper and keep it sharper longer. I just love your sewing and ironing equipment and wish you were closer to Dyersburg, TN so that I could go to your showroom. Fantastic for our manufacturing operation. Need replacement parts. Thank goodness they're available. Product was as advertised and arrived very quickly.